What I particularly like about the city of London is the way it continually surprises. 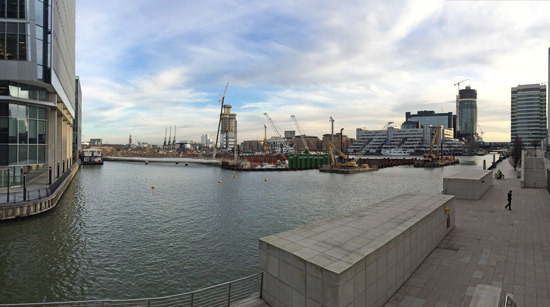 Saturday's sketchcrawl delivered again: this view from the Skygarden level of the forthcoming Crossrail station at Canary Wharf in Docklands offered another view of a place I thought I knew well. The DLR trains passed regularly over the bridge, looking down on the Financial Conduct Authority offices on the left. It was cold work – the temperature just above freezing – drawing alongside old friends, new ones, and Rafael Martin Delglado, visiting family in London with his wife from Malaga. 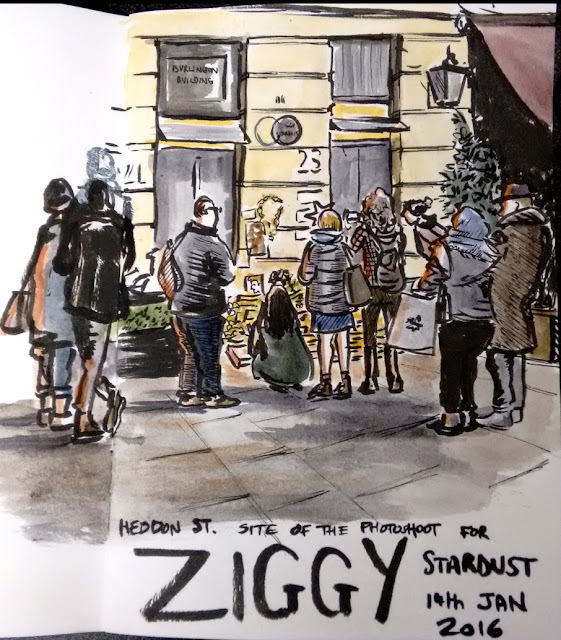 [by Nathan Brenville] For some time, I've been meaning to go and find the street where the Ziggy Stardust album cover was taken, with a view to sketching it. As one of those places that remains obscure and unknown despite the photograph's iconic status, it's my favourite type of location to sketch. 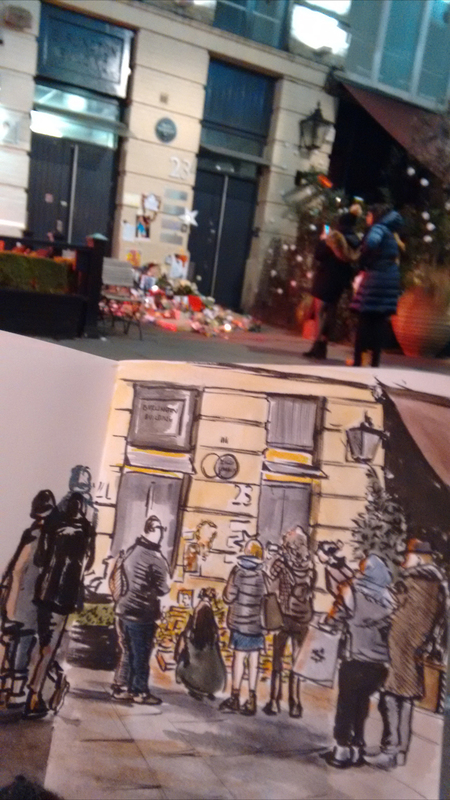 With the sad news of David Bowie's passing this week, I decided it was finally time to go there, and sketch the scene - as you can see from the photograph to the left, quite a shrine has grown up spontaneously, as people come by to leave tributes and pay their respects, from homemade efforts to DVDs and albums, to lots of flowers and candles. 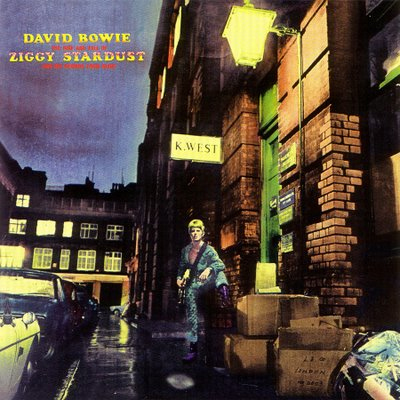 I listened to the album of Ziggy Stardust on my phone while I was sketching; I aimed to finish the drawing by the length of the album, but by the time I finished the colour I was into Aladdin Sane. Ooops. Note the mistakes. I try not to worry about making mistakes, but it still irks me that I can't rub it out the way you can working in pencil! 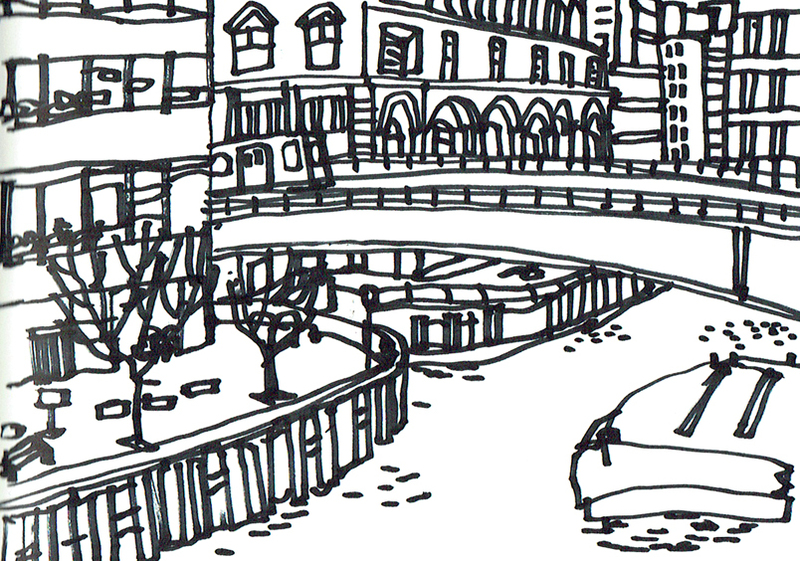 This is an update on places to meet, places to sketch and the weather for Let's Draw Canary Wharf - 16th January 2016. The VENUES FOR LUNCH AND FINISH HAVE CHANGED. First the good news. BBC Weather is predicting sunshine all day. The bad news is it goes with temperatures of about 3 degrees! This is fine for sketching so long as you dress appropriately! It's ESSENTIAL you dress with layers, wear your thermals and a warm hat! My fingerless gloves with mitten tops will also be coming out with me tomorrow. you have insulation between your rear and a very cold fixed seat outdoors. I also recommend carrying least a paper to sit on or seating pad! Thick trousers also help. Otherwise you must stand or need a stool. 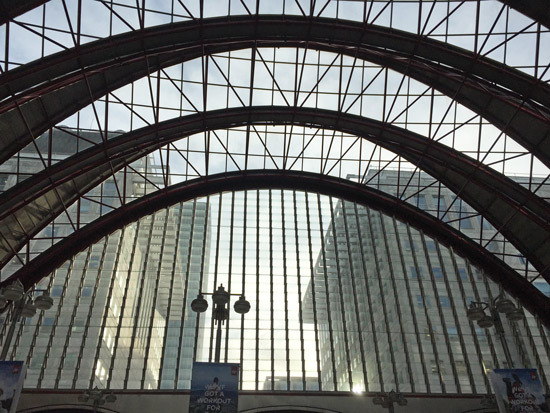 I trecked round Canary Wharf on Wednesday to check out all the venues in detail - and took lots of photos so I can describe them to you. Plus I have maps for a few people! If you have never been before the layout is VERY CONFUSING - but well signposted. I do recommend you grab one of the map guides as soon as you arrive. They're very easy to find in the shopping malls. I've already picked up some which I will bring with me but it won't be enough for everybody. 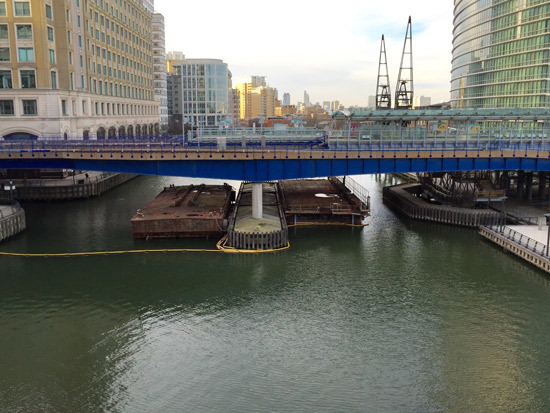 Please remember the whole of Canary Wharf is PRIVATE PROPERTY. The rules for what we can and cannot do may be different from the public domain (which this is not). However I've never had problems taking photos. 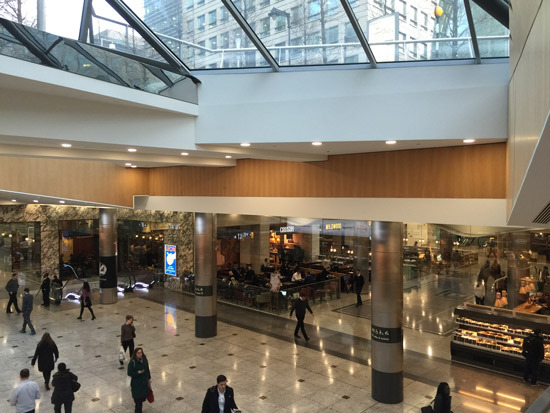 We'll meet next to the clock inbetween the UP escalators to the platforms 4 & 5 at Canary Wharf DLR Station (ie NOT the Jubilee Line). It's on the same level as the Oyster Card readers and one floor below the level of the platforms. So if you're arriving via this route you need to come down the escalators and walk across to the up escalators side. There's lots of room in the vicinity for a large group to congregate and not block people getting around. 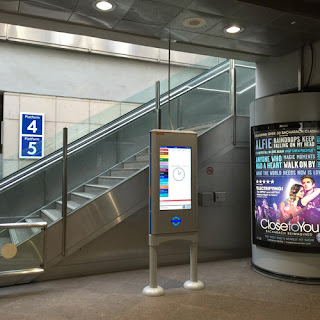 This is what the clock looks like - next to the escalator and stairs UP to platforms 4 and 5. - and it's VERY WARM! It's LOVELY AND WARM! I recommend this as a place to stay close to if you need to go and warm up periodically for 10 minutes or so during the day! I suggest we meet near these columns. 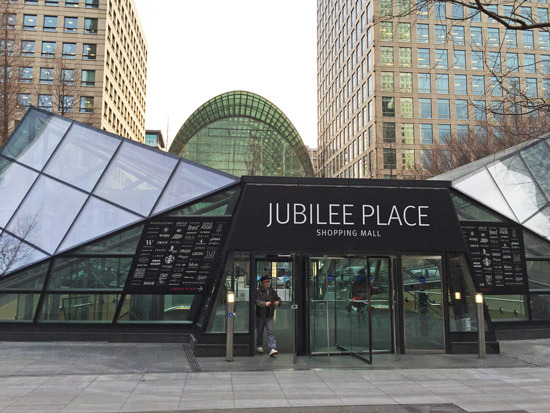 This is what the entrance to the Shopping Centre looks like in the centre of Jubilee Place Park. Note how you get in as you go as finding your way out again is not obvious! Again we have lots of space to congregate near the station and lots to sketch for those who get there early! 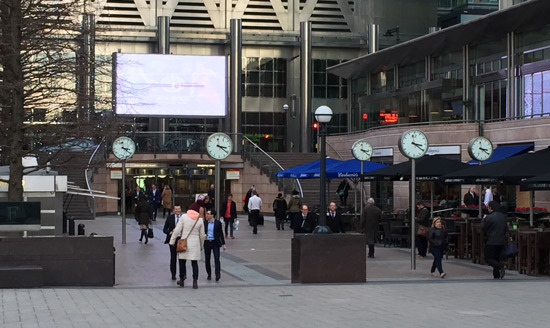 If when facing the station (as in the above photo) you can see these clocks if you look left then you've got the right entrance to the Underground! If you look left while facing the underground entrance and can see these clocks you are at the right entrance! 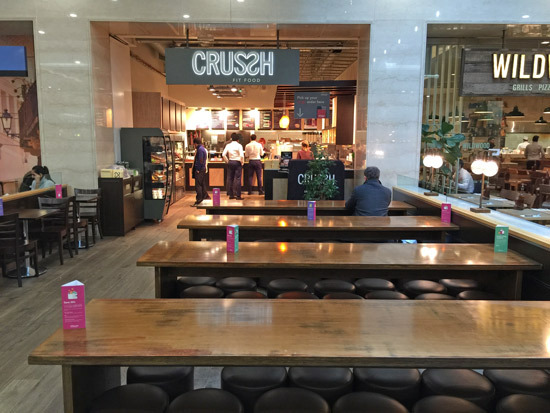 So we'll walk from the station back into the park and down the escalators to where we met and lunch and this time we'll go to Crussh Fit Food and Juice Bar Unit 21 Jubilee Place. I had a good look round for a suitable place to meet up afterwards. This was the only place that didn't have lots of teeny tables. This is what it looks like - you can also see it the centre of the previous view of the Jubilee Place shopping Mall - below ground view. It also does hot soups and coffees and teas! 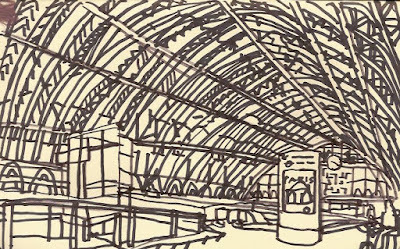 I've checked and there's nothing to stop people going up to the platforms to sketch - you don't need to use your Oyster card. I do recommend you stay well out of the way of people who are travelling. There's a good amount of space at either end of the platforms which don't get busy. Turn right and walk up to Crossrail Place - the long covered bridge to Crossrail Place (marked as Adams Plaze Bridge on the map). 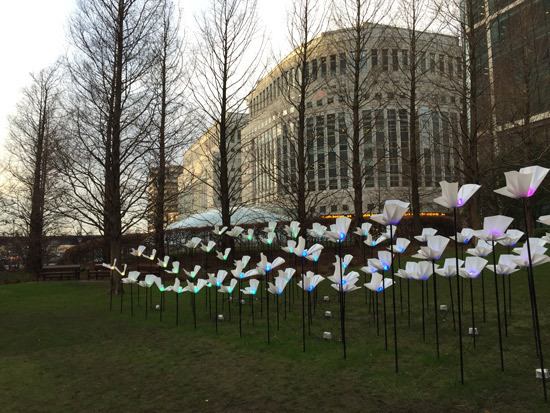 Walk down the bridge past the photography exhibition of wildlife at Canary Wharf. 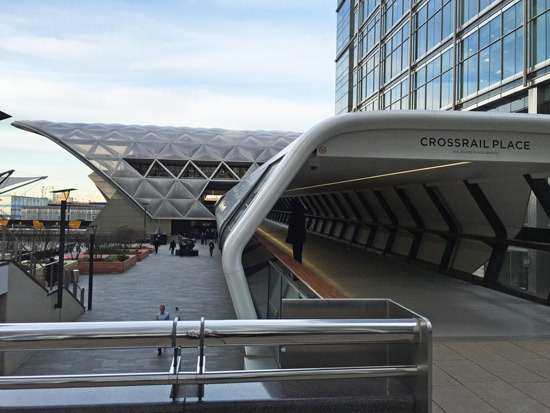 the entrance to Crossrail Place - the bridge which leads to the Sky Garden. There are great views across the dock from the windows at the end of the bridge. at the top you come out at the side of a bar/restaurant. 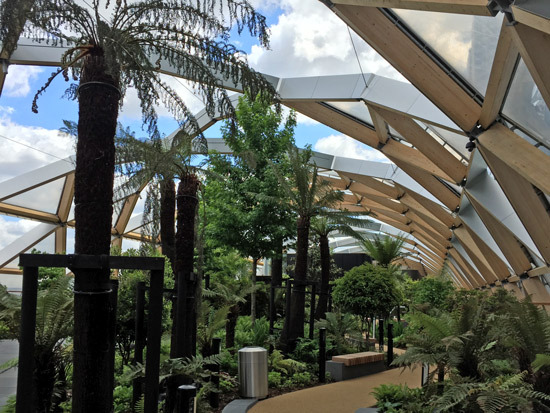 Walk straight ahead and you'll come to this view of the Sky Garden. The roof is partially open and partially closed and you're protected from stiff breezes. There are lots of seats to sit on around the garden - and there are toilets! 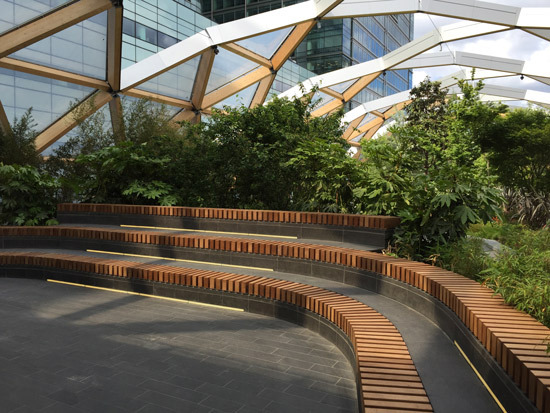 You can sit under one end of the Sky Garden and sketch the geometry and the tree ferns! The Winter Lights are not going to be on until 4pm. I didn't see much evidence of them and some were still being put up. 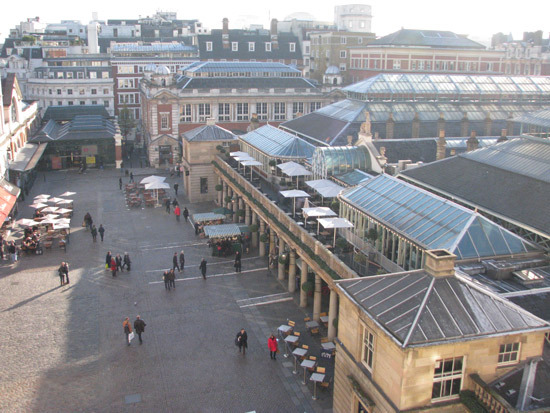 The best place to see them is Jubilee Place Park and Montgomery Square. You can see this from Montgomery Square. It's now much bigger than when I last saw it in November. 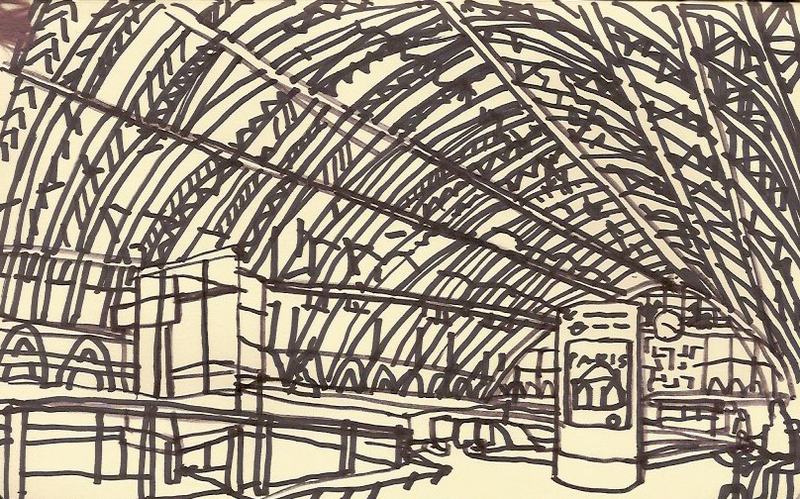 The next Let's Draw event for urban sketchers in London will be at Canary Wharf on Saturday 16th January 2016. 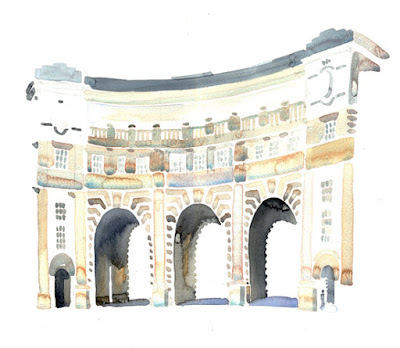 Our events are always FREE to anybody who would like to turn up and have a go at urban sketching. 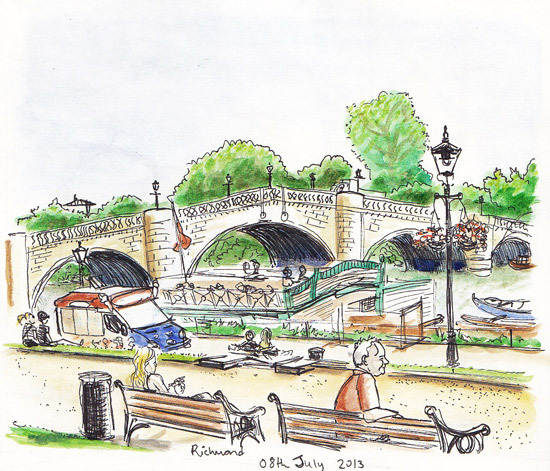 more information about what's on offer to sketch. Note that sketching the Lumiere 'objects d'art' will be best after 4pm so I'm assuming those that want to sketch them at their best will want to stay later. 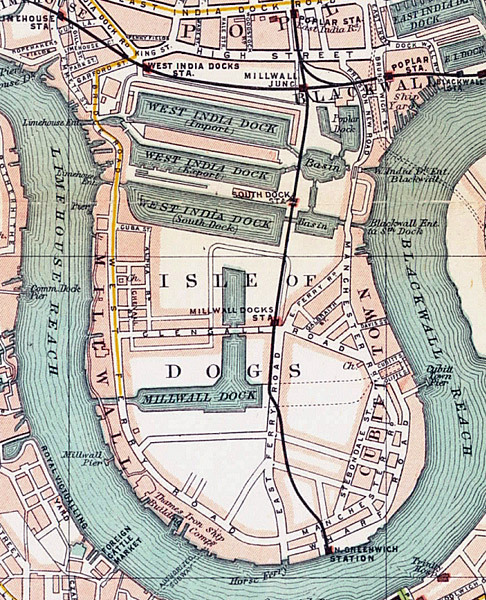 I'm assuming some people may not have been to Canary Wharf before so am providing a bit more information than usual. 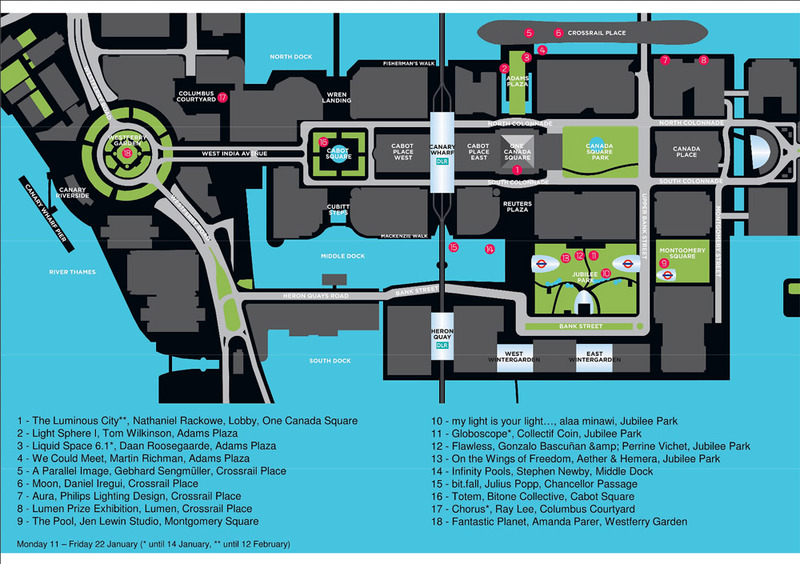 I'd make very sure you have access to a printout of a good map - or one on your phone - as it can be confusing at times - although well signposted. 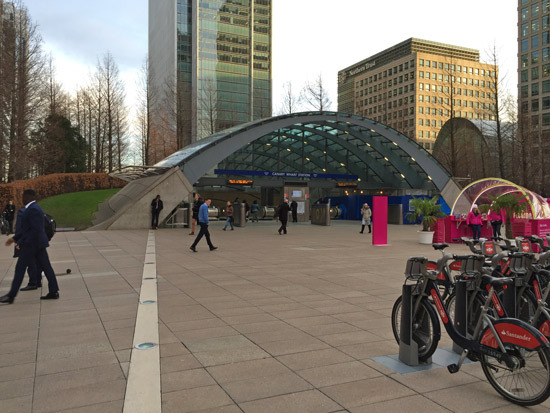 See UPDATE: re Let's Draw Canary Wharf 16 January 2016 for photographs of what different places look like. - good for sitting eat sandwiches and a photo at lunchtime! 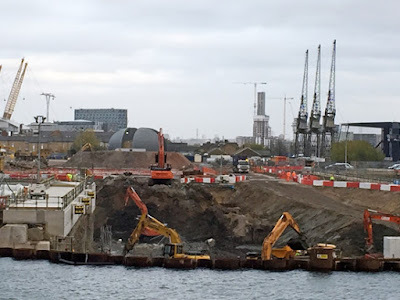 The South Dock -where the Big Dig is happening used to be called West India -South Dock. 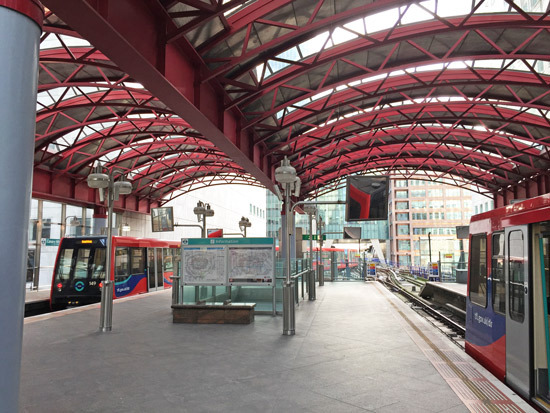 Docklands Light Railway - The DLR network runs from Bank and Tower Gateway to Stratford, Beckton and Lewisham. 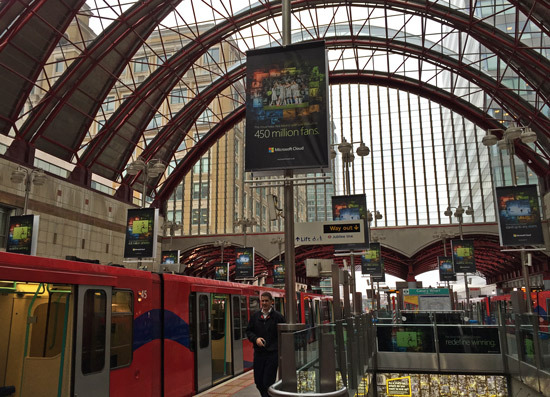 For some of the trains the Canary Wharf station is the point where you change - so it's BIG! Parking: park your car at the weekend in the car parks. You can get three hours free at the weekend if you spend more than £10 in any of the shops/cafes and get your ticket validated. This is a large station for the Docklands Light Railway in the centre of Canary Wharf with some amazing architecture. Note this is NOT the Canary Wharf Jubilee Line station. The Crossrail Sky Garden was opened this summer. There's a big going on at present in the South Dock - presumably to provide foundations for another skyscraper. Great for those who like construction and machinery to sketch! See the map for the location where this photo was taken from in November. The three cranes on the right are iconic and preserved from the days of the docks. 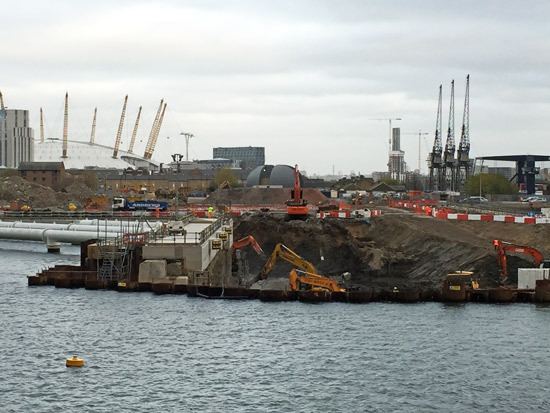 On the left you can see part of the O2 Arena. 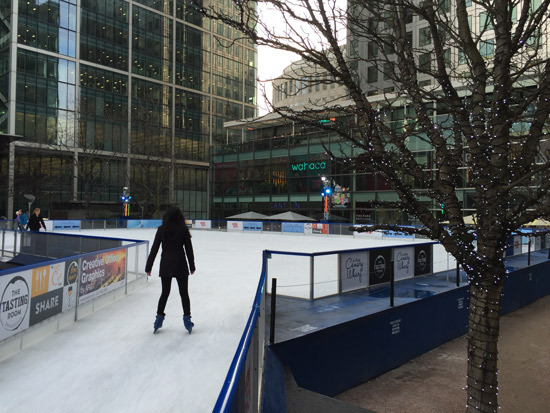 You can visit and sketch skaters on London’s largest outdoor ice rink Ice Rink Canary Wharf in Canada Square Park. 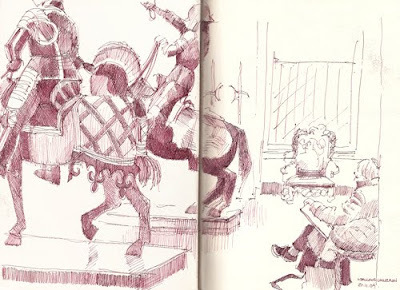 Skaters are good fun to sketch as although they keep moving they also keep making the same repeated movements and after a while you find you are sketching a bit of people and then waiting for them to come round again so you can finish them off! This is an exhibition of 18 light installations which has just been installed and is on until 22 January. The best effect will be enjoyed by anybody who decides to stay late. I suspect this will be decided by the weather and the best place to view them from somewhere warm! My understanding is that this event is associated with the Lumiere London event which runs from 14-17 January in Central London. If you have any queries please send them to the contact email address in the side column or on the sketchcrawls page. This is the provisional list of sketchcrawls and dates in 2016. 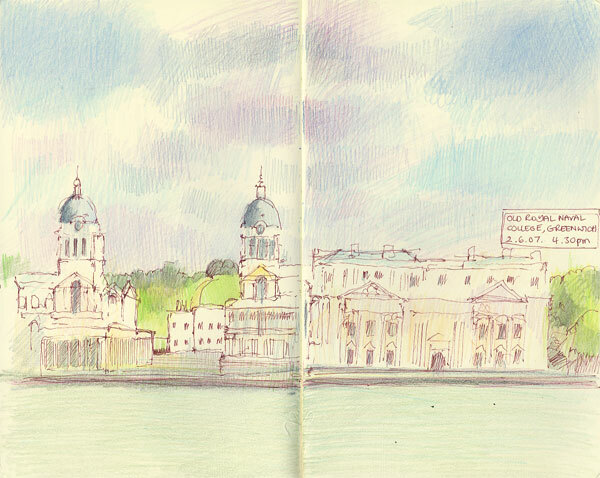 Below you'll find places that we plan to visit each month and the date of the sketchcrawl where this is now definite. More about what's Involved in organised and leading an USK London event at the end of this post. We'll be investigating what dates work best for those coming to the UK to attend the Urban Sketchers Symposium in Manchester - who'd also like to come to a sketchcrawl in London. Meet at 11.00am, 1pm and 3.30pm under the bows of the Cutty Sark. 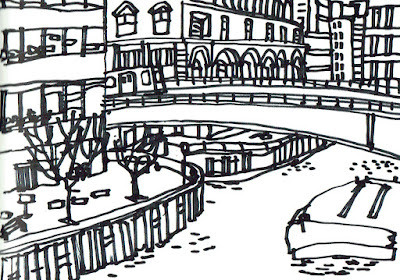 As indicated previously, Nathan Brenville has left London for a new life in Spain and we are now actively looking for new people to help out with the organisation and leading of the sketchcrawls. 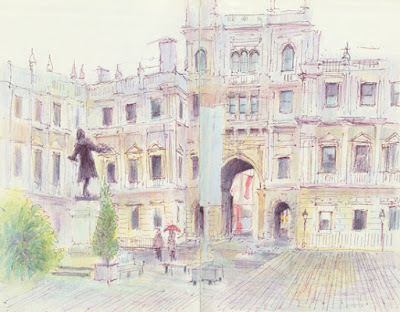 Here's what's involved in organising and leading a "Let's Draw" event for London Urban Sketchers. find the places to go if it rains! 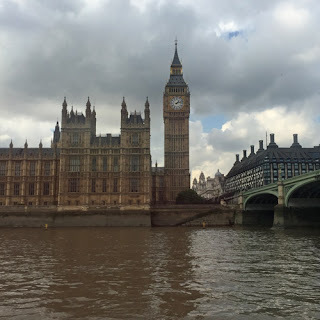 a blog post beforehand - to provide guidance on where and when. You can ask for help with images for the post. 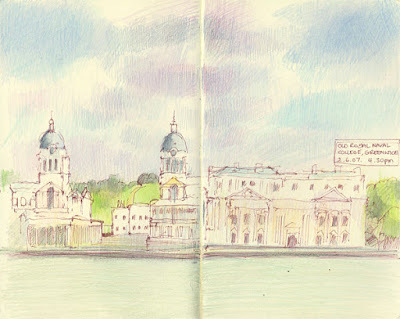 somebody who knows the area well - or is prepared to research it in advance - we all need to know the good places to sketch! research the location e.g. 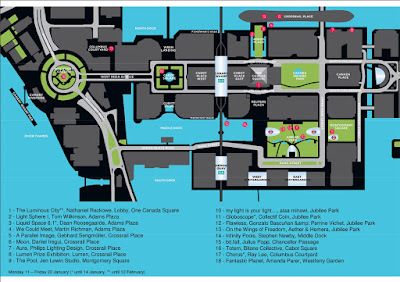 where are the public toilets / places to get sandwiches and hot drinks before, during and afterwards! If you think you'd be interested in helping out please contact us via a comment below or speak to Katherine Tyrrell or James Hobbs at any of the Let's Draw events.